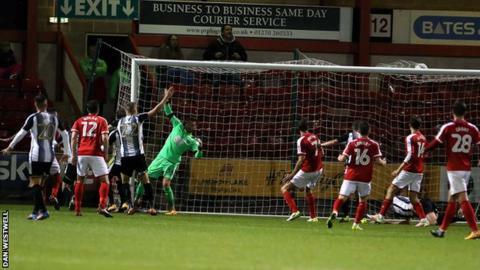 Notts County were knocked off the summit of League Two following a lacklustre showing at Crewe. Goals from Michael Raynes and Jordan Bowery secured the lowly Railwaymen the points. Crewe were the more positive side throughout, with Chris Porter twice going close before the break. County keeper Ross Fitzsimons fielded an angled drive from the frontman, but was later saved embarrassment when Elliott Hewitt's goalline clearance denied Porter. Matt Tootle, making his 50th County appearance against his former club, blazed a volley well over. It was the only effort the leaders mustered in a disappointing first-half after boss Kevin Nolan surprisingly left Jon Stead and Shola Ameobi out of his starting line-up. Crewe got their just desserts for a strong opening period when Raynes smashed the ball into the roof of the net in the 44th minute after he and Porter traded passes at George Cooper's lofted free-kick. County looked in vain for inspiration after a triple substitution saw Stead, Ameobi and Jorge Grant introduced on the hour-mark, but they fell two behind in the 66th minute when Bowery ran in behind to take a pass from Cooper and steer past Fitzsimons. Match ends, Crewe Alexandra 2, Notts County 0. Second Half ends, Crewe Alexandra 2, Notts County 0. Foul by Ryan Yates (Notts County). Michael Raynes (Crewe Alexandra) wins a free kick in the attacking half. Matt Tootle (Notts County) wins a free kick on the right wing. Corner, Notts County. Conceded by Michael Raynes. Chris Porter (Crewe Alexandra) is shown the yellow card for a bad foul. Attempt saved. Conor Grant (Crewe Alexandra) right footed shot from the centre of the box is saved in the centre of the goal. Attempt missed. Shola Ameobi (Notts County) header from the centre of the box misses to the right. Carl Dickinson (Notts County) is shown the yellow card for a bad foul. Foul by Carl Dickinson (Notts County). Corner, Notts County. Conceded by Dave Richards. Substitution, Crewe Alexandra. Harry Pickering replaces George Cooper. Shola Ameobi (Notts County) is shown the yellow card for a bad foul. Conor Grant (Crewe Alexandra) wins a free kick in the defensive half. Perry Ng (Crewe Alexandra) is shown the yellow card for excessive celebration. Goal! Crewe Alexandra 2, Notts County 0. Jordan Bowery (Crewe Alexandra) right footed shot from the centre of the box to the bottom right corner. Assisted by George Cooper. Attempt missed. George Cooper (Crewe Alexandra) left footed shot from outside the box is too high. Substitution, Crewe Alexandra. Brad Walker replaces Tommy Lowery. Ryan Yates (Notts County) is shown the yellow card for a bad foul. Jordan Bowery (Crewe Alexandra) wins a free kick in the attacking half. Attempt saved. Jon Stead (Notts County) right footed shot from outside the box is saved in the centre of the goal. Matt Tootle (Notts County) wins a free kick on the left wing.